Imagine that you have $250,000 in retirement savings and $25,000 is wiped out over just a few weeks. After losing half of your savings during the 2008 financial crisis, you might be tempted to sell everything and move into cash. In reality, history shows us that market corrections are more common than you think—you probably just have a hard time remembering them—and trying to time the market is almost always a mistake. A market correction is a 10 percent or greater decline in a stock market index. For example, an index that moves from a value of 1,000.00 to 900.00 is considered to have gone through a correction. Market corrections are considered to be a healthy retracement during an uptrend rather than a reversal into a downtrend. In contrast, bear markets occur when there is a 20 percent drop and crashes occur when there is a 40 percent drop in prices. Market corrections are surprisingly common. There have been around 25 bear markets between 1929 and 2018, which translates to an average of one every three-and-a-half years. But, there are usually two or three market corrections each year in major stock market indexes around the world. The MSCI World Index has pulled back an average of 15 percent per year, from peak to trough, since 1979, but the depth and duration of these corrections varies. The good news is that different markets experience corrections at different times. For example, the bond market typically rises if the stock market experiences a correction. Different countries also experience corrections at different times depending on their economic performance. This is why diversification—on both a country and asset level—is a good idea to maximize long-term risk-adjusted returns and minimize volatility. Market corrections may be common around the world, but they’re notoriously difficult to predict, even for expert investors and hedge funds. Some investors attempt to predict corrections by looking at valuations. The problem is that past data shows that corrections do not correlate with price-earnings ratios and, when they do occur, they don’t predict how far valuations decline. Price-earnings ratios have ranged from just 11x to more than 30x when a correction has taken place, while the decline in valuation following a correction has ranged from just 0.3x to nearly 7x. Traders often attempt to predict corrections by looking for mean reversion. If a stock market index is far from its average, it stands to reason that it will eventually return to the average. These traders often use moving averages to try and predict overbought conditions and set price targets. 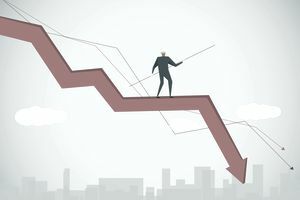 The problem is that stock market indexes regularly fall well-above or well-below these moving averages, which gives them limited predictive value. The reality is that the global stock market is a complex system. With so many factors in play, it’s impossible for traders or investors to accurately predict corrections with a high degree of accuracy. The only certainty is that there are roughly two to three corrections each year across most stock market indexes. And, traders and investors should be prepared to deal with these corrections in the best way possible when they occur. There’s a wide body of research showing that investors are best off with a buy-and-hold strategy since they’re exceptionally bad at market timing. Believe it or not, 95 percent of market gains between 1963 and 1993 came from the best 1.2 percent of trading days. You would have to predict the 90 best trading days over a 40 years period to realize at-market returns. In other words, the time in the market is much more important than timing the market. The only exception to this rule is for investors that want to reduce volatility due to near-term cash flow needs or low-risk tolerance. While these investors should already be in a more conservative asset allocation, it may be a good idea to hedge against declines using stock options or other risk mitigation strategies. A great example would be purchasing put options or initiating a covered call position on a major stock market index. For most investors, it’s a good idea to keep contributing to your retirement savings and ignore the day-to-day fluctuations of the market. If you constantly find yourself worried, it may be a good idea to talk to your financial advisor to consider a more conservative asset allocation that involves fewer price swings. The downside is that more conservative asset allocations involve lower returns than aggressive asset allocations over the long-term.